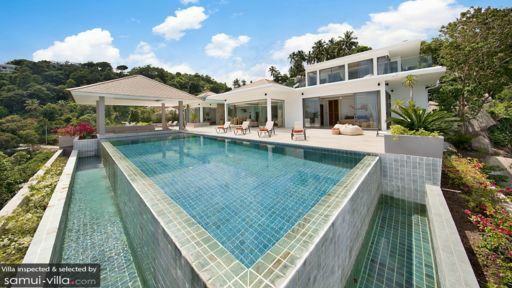 Perched atop a hill in Samui overlooking the stunning ocean and sandy beaches is Villa BelView designed with a contemporary mind and traditional accents that intersperse well to provide the best of both worlds. With four bedrooms, the villa is ideally suited for all kinds of travelling parties looking for a respite from their busy lives and wishing to escape to this tropical paradise. 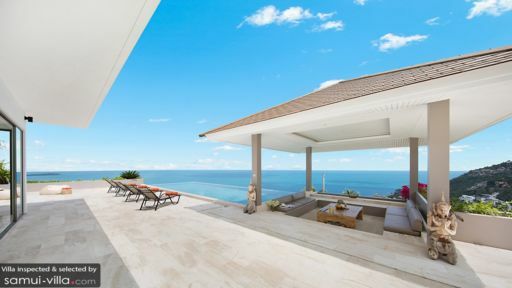 The villa offers many amenities that bring you ever closer to nature including an infinity swimming pool, a master bedroom penthouse with its own Sky Terrace that offers the most spectacular 360-degree sea view, and plenty more. The four bedrooms at BelView are fully-furnished with king-sized beds and are air-conditioned. Three of these are located at pool level with direct access to the deck and the master bedroom is a penthouse suite which not only provides ample privacy but even has its private terrace aka Sky Terrace from where you get a 360-degree view of the sea. Each bedroom comes with an en-suite bathroom for your convenience fitted with showers, natural stone basins, and wood-panelled walls. A mosaic-tiled, 15-metre infinity swimming pool takes centre-stage at BelView where you can swim to the edge of the pool to take in the splendid panoramic view of the sea with the clear, blue skies. Lounge on the sun chairs placed on the pool deck, relax under the tropical sun, and get working on that sun-kissed look! There is a Thai sala lounge right beside the swimming pool fitted with comfortable seating which is great for evening drinks and appetisers or even when you wish to enjoy the peaceful ambiance. Extending a mix of traditional and contemporary, the minimal aesthetics of BelView’s poolside living area is something straight out of a designer’s handbook. Featuring Thai ornaments, traditional artwork, contemporary furnishings, and hints of Thai culture, the living room is a complete relaxation space for guests where you can kick back and relax without a worry. 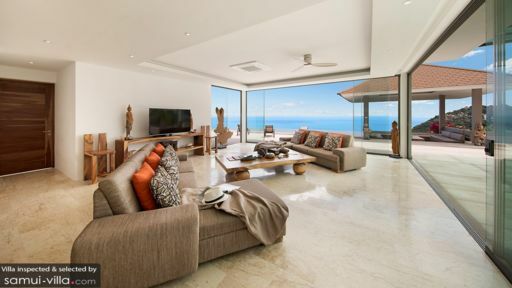 Comfortable sofas are great for napping on as well, what’s more you can even enjoy the view outdoors at all times through the glass doors that slide open to the deck. Adjacent to the living area is the open-plan dining area with a traditional, wooden dining table that seats up to eight guests at a time. This semi-outdoor space features a natural stone walls that has a rustic cabinet with antiques, a beautiful view of the ocean, and a wholesome vibe which is great for a meal. The kitchen is modern and fully-equipped with all kinds of useful appliances and amenities that you may need. Villa BelView extends its world-class services to guests with staff that includes housekeeping, concierge, security, chef (upon request), and maintenance. If you wish, you can even book transportation to take you around the island with ease! When you’re travelling to Koh Samui, you’re in for white, sandy beaches, tropical weather, and smiling faces. Chaweng is the closest area to the villa, which is popular with families for its laid-back vibe, beachside restaurants, and multiple activities. Get a private massage in town or take a safari to explore the wild part of Samui.